Let me share my travel experience in Goa during March 2015. It covers the details about overall travelling plan, hotel stay at Renzos Inn, tourist spots like various beaches, churches and spice plantation. Goa is one of the most attractive places to visit in India. This small state is famous for its beautiful beaches and has many other tourist attractions like forts, spice plantations, and museums. Many Bollywood movies like Dil Chahta Hai, Hasina Maan Jayegi, Golmaal, Singham, Rangeela, Jalwa, Kabhi Haan Kabhi Naa etc. were shot here. Goa's primary revenue comes from the tourism industry and due to this fact, Goa is now one of the fastest developing states in terms of GDP. We started thinking about this trip sometime in February 2015. Any trip planning involves choosing the tour duration, dates of travel, hotel selection and method of travel. We finalized the trip dates - from 23 March to 27 March. One of the big tasks in any travel is to find an ideal and affordable hotel with good facilities which gives value for your money. We chose 'Trivago' website though which we found that goi bimbo provides some good deals for hotels in Goa. After a lot of research, we choose Hotel "Renzos Inn", Calangute, Goa (North Goa). We booked the hotel through Goibibo Android application, which gave us hotel booking facility with "go cash", a virtual money given by Goibibo (= Rs 1000). This made our hotel cost pretty low. There are many ways to reach Goa, and we preferred to travel by train (To and Fro). As I live in Surat, we chose Train No: 19260 BVC KCVL EXP (Bhavnagar to Kochuveli). As the departure from the Surat was around 3.35 pm, the majority of our journey times spent during the night time. We reached the Thivim station around 8.30 am (2.5 hours late). Our return journey was in Train No: 22907 MAO HAPA SUP EX (Madgaon to Hapa). Overall our journey was smooth and enjoyable. We stayed in "Renzos Inn" hotel, near to Calangute beach, North Goa. The hotel had very good room service. Hostel staff was very nice and supportive. They provided us local vehicle facility at affordable rates. We do not have any complaints regarding our stay at the hotel. The hotel itself is very clean and well maintained. On the very first day, we decided to visit an old church which is Basilica of Bom Jesus. 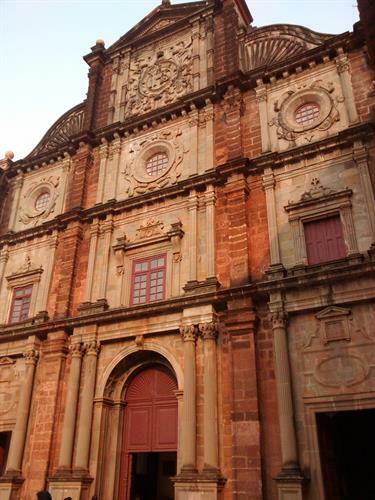 We hired a guide who explained us the history behind church and old Goa city. He also gave some brief information about St. Francis Xavier related to Basilica of Bom Jesus. It was a really nice experience to be at this holy place. At 6.30 pm, we experienced the cruise ride for nearly an hour. Cruise ride was really fun as we were entertained by the host throughout the ride. It was a really nice experience. Folk dance, songs and couple dance were major attractions on the cruise ride. 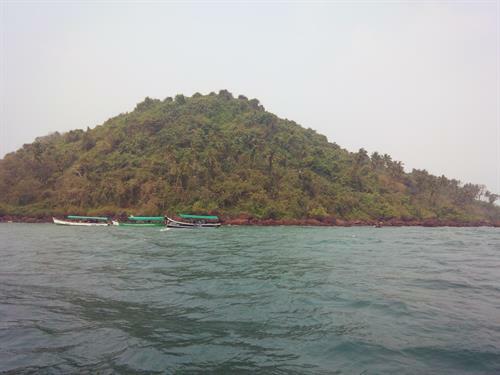 If you are visiting Goa, don't miss the boat cruise. On the second day, we visited Dona Paula beach and the shooting location where part of the shooting of the film "Singham" took place. On the very same day, we enjoyed the water sports and related rides at Calangute beach. The rides were full of excitement and it was first in a lifetime experience. After water rides and sports, we went to Aguada Fort where the Hindi Movie "Dil Chahta Hai" was shot. We enjoyed the sunset at Sinquerim beach near to the Aguada Fort. Third-day trip was at Grand Island where journey in the boat was quite exciting. Boat driver showed us Goa old central jail, which was a location for the shooting of the movie "Kayamat". Another interesting location we watched was Diamond Marchant bungalow (Film-Hasina Maan Jayegi) near to Aguada fort. Lunch was arranged for us at Monkey Beach. On the way to Grand Island, we saw lots of dolphins jumping in and out of the Arabian sea at Dolphin point. Scuba diving at Grand Island was once in a life time experience for us. At the end of the day, around 5 pm, we visited Vagotar beach. Last day of our trip included a visit to Sahakari Spice Plantation and Colva Beach. We hired a Maruti WagorR for this long journey. At Sahakari Spice plantation, we were welcomed with flowers and welcome drink, which consisted of an Ayurvedic drink of Lemongrass. 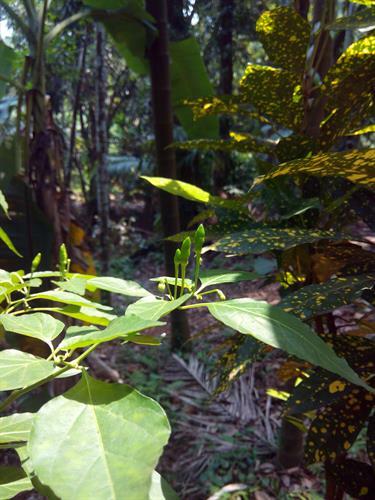 Our tourist guide helped us identify various spice plants like Arabica coffee, Portuguese Chilli, Female Pineapple, Lemongrass, Cashew, Vanilla Pod, Cardamom, Clove etc. Around 2.00 pm, we moved to Colva beach, one of the cleanest beaches in Goa, known for white sea-sand. It was very relaxing to sit on the beach and enjoy the calm sunset. Overall, all of us really enjoyed our Goa travel. After spending four days in this place, we all returned with the pledge to come back again next year. There are many travel apps that can be handy for tourists. Trip 38 pre and post booking app is one example that can organize, schedule and book tickets. Goa has now become a hub for partying and drugs. Anyways, nice to know genuine tourists finds this place interesting. Goa has many tourist places apart from beaches. We have hills, forts and waterfalls which attracts thousands of tourists. BtW, how was your view regarding the way the locals welcome tourists? Wonderful blog on a 4-day Goa experience! Goa is always a favorite destination in the world tourist map. Goa is a great tourist destination. This article beautifully explains a 4-day travel experience in Goa. To travel around Goa, tourists have to plan well before boarding the place. There are many travel agencies who takes good care and provides excellent accommodation. Absolutely amazing! super service, great value for money, wonderful experience. As I love sports especially related to water, grand island was the best. It was an excellent day out. We started our day from grand island which was an amazing start. The instructor provided us with correct equipment for our safety which allowed us to enjoy ourselves without any fear. All credit goes to you. Thanks for sharing your Travel Experiences in Goa. I really like your post. Goa is one of the most attractive places to visit in India. Nice and informative blog post. Very helpful for Goa lovers. Grand Island is a favorite tourist destination. I really enjoyed Grand Island's sea-water-sports.